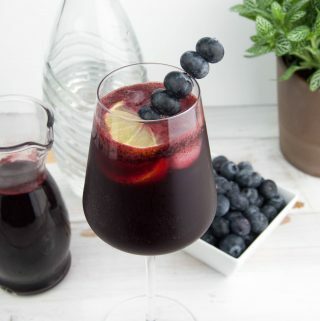 This Blueberry Gin Fizz with homemade blueberry syrup is the perfect fancy cocktail for dinner parties. You can even make different syrups for everyone to try. I love hosting parties and testing out new snack and cocktail recipes on my friends. I think they don’t mind :). Lately, I’ve been really into making my own syrups. Homemade syrups are easy to make, you can use them in cocktails or on pancakes (if the syrup is a bit thicker) and you can get really creative with mixing different flavors. 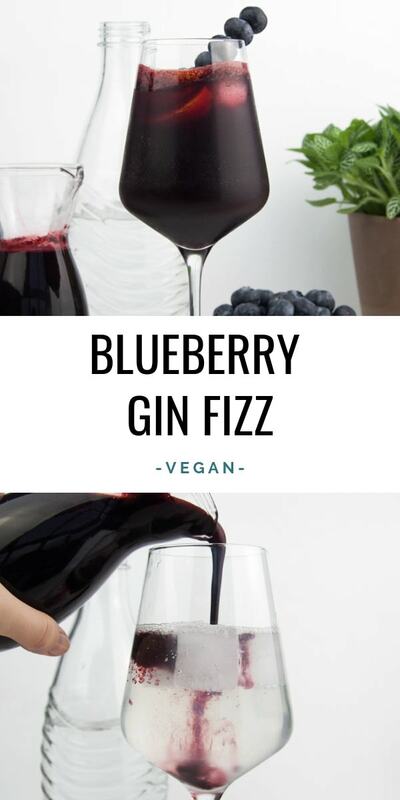 For this fancy Blueberry Gin Fizz cocktail, I’ve made my very own blueberry syrup with frozen blueberries (hence the dark and intense color). Making syrup from scratch is really easy, you only need sugar and water for a base version. I’ve added frozen blueberries and lemon zest for the flavor and color. 4 ingredients! That’s all you need for a delicious homemade blueberry syrup. 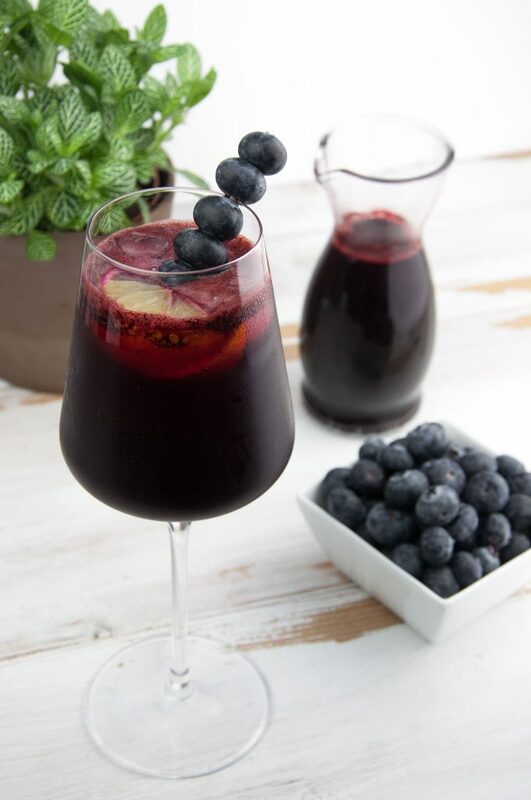 The blueberry syrup can be prepared up to a week in advance. You could also experiment with different fruits such as raspberries, strawberries or mango and make a couple of syrups for your guests to try out and enjoy! When you make this recipe, you will end up with leftover blueberry chunks. But don’t worry, we are not letting them go to waste. I’ve included a quick recipe for a Zero-Waste-Jam in the recipe’s notes. Readers from Germany, Austria, and Switzerland: hop on over to the German version of this recipe to win a SodaStream Sparkling Water Maker. Pour the sugar and water in a medium sized pot and bring it to a boil on medium to high heat until the sugar has dissolved. Add the lemon zest and frozen blueberries and let it cook for about 10 minutes. Mash the blueberries with a fork or a potato masher. Once the mixture thickens a bit, pour the blueberry syrup carefully through a sieve to remove blueberry chunks. Then you can fill the blueberry syrup in a clean glass bottle. 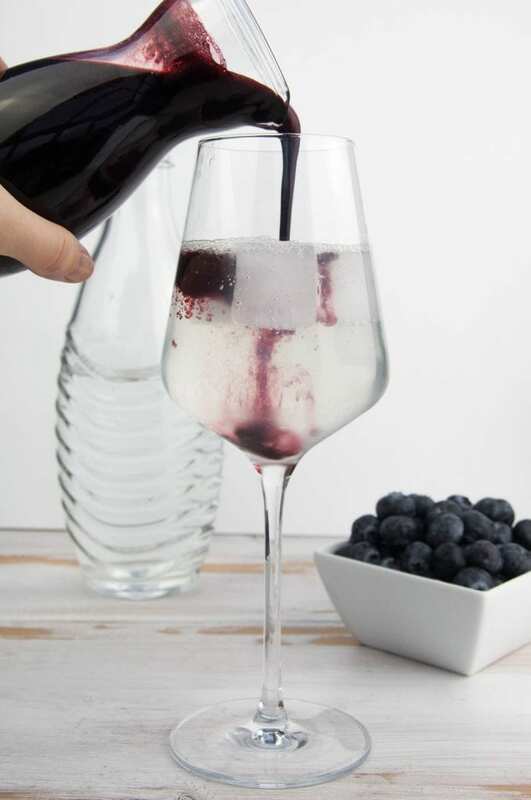 For each Blueberry Gin Fizz, add two ice cubes, gin, sparkling water and the blueberry syrup to a glass. 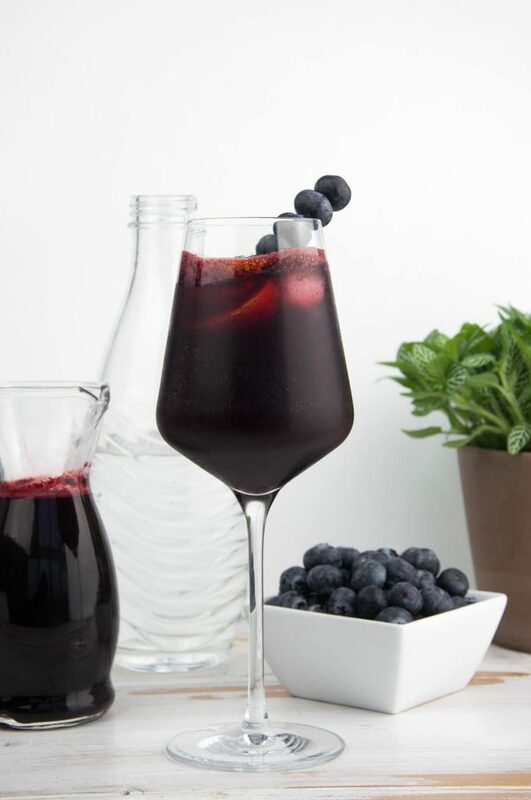 Garnish with fresh blueberries and lemon slices and enjoy (responsibly)! Storage: You can keep the blueberry syrup in a glass bottle in the fridge for about 1 week. Zero-Waste-Jam: It would be a waste to throw out the chunky blueberry bits because you can make a simple blueberry jam with it! Simply put the blueberry chunks back into the pot, add 1-2 tablespoon water and 1/4 teaspoon chia seeds and let it cook once again. You could even add more sugar for a sweeter jam (if you feel like it). Give it a good mix and fill it in a small glass jar. You can store it in the fridge for 1-2 weeks. *Not sure if the alcohol you're using is vegan? You can find it out on Barnivore! I know, right? It makes it fancy and fresh. :) And good quality blueberries are so juicy too!